一种路由内容的方法，该方法包括从第一接口接收兴趣报文，其中所述兴趣报文包括带有第一内容名称的内容名称字段、目的地字段以及设置为广播的广播标志字段，其中所述广播字段指示所述第一接口以前是否接到过含有所述第一内容名称的请求，以及从第二接口接收数据报文，其中所述数据报文包括带有第二内容名称的内容名称字段、带有与所述第二内容名称关联的数据源标识的源字段和带有与所述第二内容名称关联的数据的数据字段。 A route content, the method comprising receiving a packet from the first interface of interest, wherein the interest message includes a content name field with the name of the first content, and the destination field is set to broadcast the broadcast flag field, wherein the broadcast field indicates whether a previously received the first interface through the first content request containing name, and a second interface to receive data from the packets, wherein the data packet includes a name of a content with a second content name field, a source field associated with the second content identification name of the data source and a data field with the data associated with the name of the second content. 本发明要求2012年2月16日由谢海永(Haiyong Xie)等人递交的发明名称为“用于内容导向网络中可扩展路由的方法(A Method for Scalable Routing In Content-Oriented Networks)”的第61/559702号美国临时专利申请案的在先申请优先权，该在先申请的内容以引用的方式全文并入本文本中。  The present invention claims the invention on February 16, 2012, filed by the Haiyong Xie (Haiyong Xie) et al., "Methods for content-oriented routing network can be extended (A Method for Scalable Routing In Content-Oriented Networks)" No. 61/559702 filed prior U.S. provisional patent application, the contents of which prior application is incorporated by reference in its entirety herein by reference. 基于名称的路由是网络路由的当前范例。  routing is based on the name of the current paradigm of network routing. 基于名称的路由已服务于传统的“主机到主机”通信模型多年。 Based on the name of the route have been serving in the traditional "host-to-host" model of communication for many years. 名称导向网络的成就包括内容中心网络（CCN)和命名数据网络(NDN)。 Name achievement-oriented network includes a content-centric network (CCN) and named data network (NDN). 然而，近来出现了由“主机到主机”模型向“主机到内容”或“主机到信息”模型转变的范例。 However, recently there has been an example of "host-to-host" model to the "host-to-content" or "Host-to information" into the model. CCN和NDN尝试采用基于名称的路由来开启“主机到内容”通信模型，具体是通过使用有结构名称的内容对象。 CCN NDN and try to open the route using name-based "to the content host" communication model, in particular with a content object by using the structured name. 在基于名称的路由中，如CCN和NDN，拥有原始内容对象的内容源可将名称前缀公布于网络中。 In the name-based routing, such as CCN and NDN, with original content of the object content source name prefix can be released in the network. 此种公告可通过域内路由协议，如开放式最短路径优先(OSPF) 等，传播至整个网络。 Such announcement by intradomain routing protocols such as Open Shortest Path First (OSPF), etc., propagated to the entire network. 每个路由器中的转发信息库(FIB)可存储所述路由器可转发请求与特定名称前缀匹配的命名内容的消息至哪个接口（“端口”）。 Each router forwarding information base (FIB) may store the designated content router may forward the request to match a specific message name prefix to which interface ( "port"). 当收到名称前缀公告时，每个路由器可相应地更新对应的FIB。 Upon receiving the name prefix announcement, each router may update the corresponding FIB. 客户端可发送请求感兴趣内容的兴趣报文，网络可用所请求内容的数据报文予以响应。 The client may send a request to the content of interest interest message, the available network data content request packet responds. CCN和NDN也可使用其它组件，如内容存储器(CS)和待定兴趣表(PIT) XS可用于存储可缓存内容对象以保证高效的内容分发，PIT可用于聚集请求同一内容的待定兴趣并将数据报文，如以多播方式，传播至请求客户端。 CCN NDN and other components may also be used, such as content store (CS) and a pending interest table (PIT) XS contents of the cache can be used to store the object in order to ensure efficient content distribution, the PIT may be used to aggregate requests for the same content data pending interest and packet as a multicast manner, requesting propagated to the client. 然而，CCN(和NDN)中的基于名称的路由也可能造成网络扩展问题。  However, CCN name-based routing (and NDN) in network expansion can also cause problems. 在当前CCN设计中，内容源(或者内容的第一跳路由器)必须通过域内协议(如0SPF)或者类似协议(如类似于互联网协议（IP)前缀如何发布于域内网中）传播至整个网络。 In the current CCN design, content source (or first-hop router content) must be within the agreement (such as 0SPF) or similar protocols (such as similar to the Internet Protocol (IP) prefix how to publish on domain networks) spread to the entire network. 这种方案在本文本中称为主动路由方案。 This scheme is called proactive routing in the present embodiment herein. 然而，未来系统的不同名称前缀数量即使在高度聚集后预计也会很大。 However, the number of different name prefixes future systems will be great even after the expected high degree of aggregation. 传播大量的名称前缀可能正是难题所在，因为这会使路由器过载并消耗相当大一部分带宽。 Spread a lot of name prefix may be just what the problem lies, because it makes the router is overloaded and consume a significant portion of the bandwidth. 此夕卜，名称前缀数量可能为传统FIB可存储量级的数倍，因而FIB可能只存储名称前缀的一个子集或一部分。 This evening Bu, names may be prefixed number multiple of the order of a conventional FIB may be stored, thus FIB may only store a subset or portion of the name prefix. 因此，FIB可能在其没有关于转发兴趣至何处的信息时缺失。 Therefore, FIB may be missing when it has no information about where to forward the interests of. 此种缺失可能很常见，且基于名称的路由可能严重依赖备选方案，例如广播兴趣等，来处理FIB缺失，从而降低网络性能和用户体验。 Such deletions may be very common, and based routing name may rely heavily on alternatives, such as broadcasting interests, etc., to deal with FIB missing, thereby reducing network performance and user experience. 进一步地，CCN中采用的备选方案可能会成为路由器过载、网络带宽消耗过大以及网络性能降低的另一诱因。 Furthermore, the alternative use of CCN router may become overloaded, excessive consumption of network bandwidth and decrease network performance further incentive. 现已提议重用域内路由协议(如能适应CCN的0SPF)来将名称前缀传播至域内网络中的所有路由器。  has been proposed to reuse the intra-domain routing protocols (e.g., to adapt to the CCN 0SPF) to be propagated to all routers in the name of the prefix of the network domain. 然而，名称前缀的数量可能至少会以互联网中域名的规模来增加。 However, the number of possible name prefix will be at least the size of the Internet domain name to increase. 重用类似OSPF这样的协议可能会进一步给网络扩展带来难题。 Reuse OSPF protocol like this could bring further problems for network expansion. 例如，假设域名平均长度大约为16 字节，大约5亿个域名的公告可产生8 X 109字节的流量。 For example, suppose the domain name of an average length of about 16 bytes, approximately 500 million domains may generate ads 8 X 109 bytes of traffic. 如果这些名称每隔1分钟发布一次， 则对于每一个链路，周期性的主动公告消耗的平均带宽大约为1千兆比特每秒(Gbps)。 If these published once every one minute, then for each link, the average bandwidth consumption periodically active bulletin about 1 gigabit per second (Gbps). 此夕卜，名称前缀的数量可能大于域名的数量，例如是域名数量的10倍，导致由名称前缀公告消耗的带宽高达约lOGbps。 Bu this evening, name prefix number may be greater than the number of domain names, for example, it is 10 times the number of domain names, name prefix announcement caused by the consumption of bandwidth of up to about lOGbps. —方面，本发明包括一种路由内容的方法，该方法包括从第一接口接收兴趣报文， 其中所述兴趣报文包括带有第一内容名称的内容名称字段、目的地字段以及设置为广播的广播标志字段，其中所述广播字段指示所述第一接口以前是否接到过含有所述第一内容名称的请求，以及从第二接口接收数据报文，其中所述数据报文包括带有第二内容名称的内容名称字段、带有与所述第二内容名称关联的数据源标识的源字段和带有与所述第二内容名称关联的数据的数据字段。  - aspect, the present invention includes a routing of content, the method comprising receiving a packet from the first interface of interest, wherein the interest message includes a content name field with the name of the first content, and the destination field field is set to broadcast broadcast flag, wherein the broadcast field indicates whether the first interface through the previously received content request containing the first name, and from the second interface to receive data packets, wherein the data packet includes a content name field with the name of the second content, the source field identifies the data source name associated with the second content data and a data field associated with the name of the second content. 另一方面，本发明包括一种装置，该装置包括处理器，用于从第一转发接口（端口） 接收兴趣报文，其中所述兴趣报文包括带有内容名称的内容名称字段，将所述内容名称和所述第一端口的标识添加到PIT中，从FIB中获取与所述内容名称关联的目的地，从可达性信息库(RIB)检索与通往所述目的地的传输路径关联的第二端口的标识，以及将所述兴趣报文转发至所述第二端口。  In another aspect, the present invention includes an apparatus comprising a processor, the first interest message for forwarding interface (port) is received from, wherein the interest message includes a content name field with the name of the content , adding the content name and the identifier of the first port to the PIT, the destination name associated with obtaining the content from the FIB, the reachability information base (RIB) retrieving said access destination identifying a second port associated with the transmission path, and forwards the interest packet to the second port. 另一方面，本法明包括一种计算机程序产品，该产品包括存储在非临时性媒质上的计算机可执行指令，处理器执行这些指令时，会执行如下操作：从请求端口接收兴趣报文，其中所述兴趣报文包括带有内容名称的内容名称字段，在CS中检查与所述内容名称关联的记录，如果该CS记录存在，则从该记录发送数据至所述请求端口，如果该CS记录不存在，则在PIT中检查与所述兴趣报文关联的现存记录，如果该PIT记录存在，则丢弃该兴趣报文，如果该PIT记录不存在，则创建包含内容名称和所述第一端口的标识的PIT记录，检查FIB中与所述内容名称关联的FIB记录，其中所述FIB记录包括一目的地，如果该FIB记录存在，则从所述FIB中检索所述目的地，从RIB中检索与通往该目的地的路径关联的第二端口的标识，并将所述兴趣报文转发至所述第二端口；如果该FIB记录  On the other hand, Act invention includes a computer program product which includes a computer storage medium on a non-transitory executable instructions, the instructions when executed, it performs the following operations: receiving a request from the ports of interest packet, wherein the interest message includes a content name field with the name of the contents, checking the record name associated with content in the CS, the CS if the record exists, the transmission data from the record to the requesting port, If the record does not exist in the CS, PIT then check packets associated with the packet of interest existing record, if the record exists PIT, the interest packet is discarded, PIT if the record does not exist, then created containing the content name and PIT records the identity of said first port, FIB and FIB inspection record associated with the content name, wherein the FIB comprises a recording destination, if the record exists in the FIB, the FIB retrieved from the destination , from the identification of the second port and the path leading to the destination RIB retrieve the associated interest and the packet is forwarded to the second port; if the FIB record 不存在，则将所述兴趣报文转发至多个相邻端口。 It does not exist, the interest packet forwarding to multiple adjacent ports. 为了更全面地理解本发明，现在参考以下结合附图和具体实施方式进行的简要描述，其中相同参考标号表不相同部分。  For a more complete understanding of the present invention, reference is now not part of the same table in conjunction with the accompanying drawings briefly described with reference to the following specific embodiments and wherein like reference. 图1描述CCN/NDN中的无响应兴趣（Interest Starvation)问题场景。  Figure 1 depicts CCN / NDN is unresponsive interest (Interest Starvation) problem scenarios. 图2为一种内容路由器的一项实施例，该内容路由器用于执行一种内容导向网络中可扩展路由的方法的一项实施例。  FIG. 2 as a content router according to one embodiment, the content router for performing one embodiment of a content-oriented routing network scalable method. 图3示出可用于使能被动路由的兴趣报文和数据报文的实施例。  FIG. 3 shows an embodiment may be used to passively route interest packets and data packets. 图4示出内容路由器从端口接收兴趣的一项实施例的流程图。  FIG. 4 shows a flowchart of an embodiment of a content of interest received from the router ports. 图5示出内容路由器接收返回数据的一项实施例的流程图。  FIG. 5 shows a flowchart of the content router to receive data back one embodiment. 图6示出所述被动路由方案的一项实施例中平均E2E时延的汇总结果。  FIG. 6 shows a summary of the results of passive routing scheme embodiment the average delay E2E one embodiment. 图7示出所述被动路由方案的一项实施例中CS匹配比例的汇总图形化结果。  FIG. 7 illustrates the routing scheme of a passive graphic summary of the results of the matching ratios embodiment CS embodiment. 图8示出所述被动路由方案的一项实施例中FIB匹配比例的汇总图形化结果。  FIG. 8 illustrates the routing scheme of a passive summary graphical results matching ratio FIB embodiment. 图9示出所述被动路由方案的一项实施例中广播报文数量随CS大小改变的情形。  FIG. 9 illustrates the routing scheme of a passive embodiment, the number of broadcast packets with the case of changing the size of CS embodiment. 图10示出所述被动路由方案的一项实施例中结果随FIB大小改变的情形。  FIG. 10 illustrates the case of a passive embodiment of a routing scheme results in a change in size with FIB embodiment. 图11示出所述被动路由方案的一项实施例中两者结合对广播开销减少的影响。  FIG. 11 illustrates the routing scheme of a passive embodiment both binding effect on the reduction of the broadcast overhead embodiment. 图12示出一种通用网络装置。  FIG. 12 illustrates a general network device. 最初应理解，尽管下文提供一个或多个实施例的说明性实施方案，但可使用任意数目的当前已知或现有的技术来实施所公开的系统和/或方法。  Initially to be understood that while the following illustrative embodiments provide one or more embodiments embodiment, but may be used in the prior art currently known or to implement any number of systems and / or methods disclosed. 本发明决不应限于下文所说明的描述性实施方案、图式和技术，包含本文所说明描述的示范性设计和实施方案，而是可以在所附权利要求书的范围以及其均等物的完整范围内修改。 Full description of the present invention is in no way be limited to the embodiments described hereinafter, drawings, and techniques, including the exemplary designs and embodiments described herein are described embodiment, but may be claimed in the appended claims and their equivalents in the range of modifications within the scope. 本文公开在CCN和NDN等基于名称的网络中使能基于名称的被动路由以处理网络扩展难题的系统、方法和装置。  herein disclosed in CCN NDN and the like based on the name of the passive network enabled in name-based routing to a processing system, method and apparatus for network expansion problems. 本发明包括在系统架构中添加RIB以及修改FIB的语义。 The present invention includes adding semantic RIB and FIB modification in the system architecture. 本发明进一步包括修改互联网报文和数据报文报文头以支持RIB/FIB变更。 The present invention further comprises a modified internet packets and data packet header to support RIB / FIB change. 传统内容路由器可包括索引、CS、PIT和FIB，其中所述FIB存储所需内容的名称前缀和转发信息。  The conventional content router may include an index, CS, PIT, and FIB, wherein said desired content name prefix FIB store and forward information. 与传统内容路由器不同，此处公开的内容路由器的实施例（如图2所示的内容路由器200)，可包括RIB以发挥面向主机路由的优势。 Traditional router with different content, (the content router 200 shown in FIG. 2) embodiments herein disclosed content router may include RIB oriented to exert the advantages of host routes. 具体为，所述RIB可存储转发端口， 所述转发端口可由所述内容路由器使用以到达网络中的任意路由器。 Specifically, the RIB may store a forwarding port, the port may be forwarded to the content using an arbitrary router to router in the network. 在典型的域内网络中，路由器的数量可能不到千个。 In a typical network domain, the number of routers may be less than one thousand. 由于路由器使用本文本描述的域内路由协议来发布其名称，因此每个内容路由器能够独立创建本地RIB。 Since the router using intra-domain routing protocol described in this article to publish their names, so each content router can independently create a local RIB. 如果任意RIB记录中可存在多个转发端口， 多路径路由可能是可行的，然而，路由循环预防方案可替代使用。 If there may be a plurality of ports to forward any RIB recording, multi-path routing may be possible, however, routing loop prevention programs may be used instead. 如果任意RIB记录中只能有单个转发端口，则路由可能为单路径路由，且CCN中潜在的多路径路由的优点可能会丧失。 If any of the RIB record only a single port forwarding, the route may be single-path routing, and CCN potential advantages of multi-path routing may be lost. 然而，其优点在于简化了路由和改善了可扩展性。 The advantage, however, is to simplify and improve routing scalability. 另外，所公开的实施例可包括修改的FIB，其中每个FIB记录可存储一个名称前缀和该前缀的“路标”路由器的名称。 Further, embodiments may comprise a modified embodiment of the disclosed FIB, each FIB record may store "roadmap" name prefix a name of the router and the prefix. 配置有所公开的头信息的数据报文可携带源名称(或者中间路由器名称）。 Configuration has disclosed a data packet header information may carry the name of the source (or intermediate router name). 因此，当接收到此种数据报文时，内容路由器可相应地更新其FIBXS和PIT可像典型CCN/NDN那样配置。 Therefore, when receiving such a data message, the content router may update its FIBXS and PIT may be configured as like a typical CCN / NDN. 本发明包括使用这些或其他变更以产生被动路由方案，例如在一个方案中，仅当前缀兴趣注入网络中时，系统才使用被动公告公布名称前缀。 When  the present invention comprises the use of these or other changes to produce passive routing scheme, for example, in one embodiment, only the current injected into the network prefix of interest, the system only uses passive bulletin published name prefix. 主动公告可能会消耗相当大一部分网络带宽并导致路由器过载，结果，公布访问较少、很少访问或不访问内容的名称前缀会浪费网络带宽。 Initiative announcement may consume a large portion of network bandwidth and cause the router overload, results, announced visit less, little or no access to access the content name prefix will waste network bandwidth. 被动路由方案可考虑内容流行度并可在有兴趣时提供公告。 Passive routing scheme may be considered content popularity and provide notice when interested. 考虑流行度可进一步使该方案像缓存那样缓存路由记录，例如，通过动态清除冷门记录来为热门记录腾出空间。 Consider the popularity of the program may further make records like that cache routing cache, for example, to make room for popular record by clearing upset the dynamic record. 图1示出了CCN/NDN100中的无响应兴趣问题场景。  FIG 1 illustrates a problem of interest in response to a scene without CCN / NDN100 in. 在CCN/NDN100中，10个网络节点102-120,如路由器、服务器、交换机等，通过连接122以所描述的方式彼此互联。 In CCN / NDN100, the network nodes 102-120 10, such as routers, servers, switches, etc., interconnected to each other by connection 122 as described. 图1进一步示出与节点106中的CCN/NDN相连的第一客户端124、在102中连接的第二客户端126以及在节点116中连接的内容源128。 Figure 1 further shows a first client node 106 and CCN / NDN is connected to terminal 124, the second client 102 is connected to terminal 126 and content source 116 is connected to node 128. 如图所示，第一客户端124可发送请求内容源128 (如路由器或服务器等)拥有的内容的兴趣(如兴趣报文)至节点106。 As shown, client 124 may send a first request content source 128 (such as a router or server, etc.) have a content of interest (e.g., interest message) to the node 106. 节点106可将所述兴趣广播至其相邻节点110、112和120。 Node 106 may broadcast the interest to its neighboring nodes 110, 112 and 120. 出于简洁考虑，到达内容源128的兴趣报文广播传送并未示出，因为他们可能到达他们的目的地，结果导致不能阐明无响应兴趣问题。 For brevity, the contents of the source file to reach the broadcast delivery of 128 reported interest is not shown, because they could reach their destination, the result can not clarify unresponsive interest issues. 现讨论缺乏问题场景，一些兴趣报文在其“缺乏”前可能未到达内容源。  now discuss the lack of scene, some of the interest message in its "lack" may not arrive before the content source. 缺乏指CCN/NDN中兴趣可能最终在PIT中待定的情况。 Refers to the case of lack of CCN / NDN of interest may ultimately be determined in the PIT. 当接收到与PIT中的待定兴趣请求相同内容的兴趣时，内容路由器可尝试通过追踪哪个端口发送该兴趣且不转发所述新接收到的兴趣来避免重复兴趣发送。 Upon receiving the PIT with the interest in the pending interest requests the same content, the content router may attempt to send the interest by tracking which port does not forward the received new interest to avoid duplicate transmission of interest. 当兴趣报文之前已经转发至网络节点，但所述兴趣对应的数据(如数据报文）（a)尚未在兴趣节点接收到，以及(b)尚未在相关网络节点上的PIT中超时时，可能会出现缺乏问题。 Before interest message has been forwarded to the network node, but the corresponding data of interest (e.g., data packets) (a) has not been received at the node of interest, and (b) Not Super PIT always on the relevant network nodes, may there will be a lack of problems. 例如，由第一客户端124发送的兴趣报文可分别到达远端节点102和114。 For example, a first end 124 sent by the client may be interested in packet reaches the distal end 102 and node 114, respectively. 节点102可通过节点106、110和108接收转发的兴趣。 Node 102 may receive forwarded by node 106, 110 and 108 of interest. 节点114可通过节点106、120和102接收兴趣报文。 Node 114 may receive packets through the node of interest 106, 120 and 102. 当分别接收和处理兴趣报文时，节点102和114均会有在其PIT中索引的待定兴趣。 When received and processed separately interest message, the node 102 and 114 are pending interest have its index in the PIT. 后续转发的兴趣报文，如从节点102转发至节点114的兴趣报文和从节点114转发至节点102的兴趣报文，会分别在节点114和102中的PIT中有匹配。 Forwarding subsequent packets of interest, such as forwarded from node 102 to node 114 and the interest message is forwarded from node 114 to node 102 of interest message will match respectively the PIT 102 and node 114. 由于待定兴趣的处理方式，当发现PIT匹配时，不会发生进一步的转发，例如将报文逆时针转发至节点108或110。 Since the handling of pending interest, PIT match when found, a further forwarding does not occur, for example, the packet is forwarded to node 108 or counterclockwise 110. 当节点110 后续接收到满足该兴趣的数据报文时，节点110不会转发该数据报文至节点108,因为未从节点108接收到兴趣报文。 When the node 110 satisfies the interest subsequently received data message, node 110 will not forward the data packet to node 108, because node 108 is not received from the interest message. 由于节点110不转发数据报文至节点108,节点108、114、102和120 可能有PIT表项且未收到该数据。 Since the node 110 does not forward the data packets to the node 108, and node 120 may have 108,114,102 PIT entry of the data is not received. 该情况在本文中称为无响应兴趣场景。 This condition is called unresponsive scene of interest herein. 图2示出内容路由器200 (例如图1中的网络节点102-120)的一项实施例，该内容路由器可设计为执行一种内容导向网络中可扩展路由的方法的一项实施例。  Figure 2 illustrates a content router 200 (e.g. the network nodes in FIG. 1102-120) in the embodiments, the content router may be designed to perform the method of one embodiment content oriented network is scalable routing example. 内容路由器200 可包括03202、？ The content router 200 may comprise 03202 ,? 几204小18206、1?18208、索引表210和多个端口211，其中所述索引表210指向所述CS202、PIT204、FIB206和RIB208。 Few small 18206,1 204? 18208, the index table 210 and a plurality of ports 211, wherein the index table 210 points to the CS202, PIT204, FIB206 and RIB208. 所述CS202可包括用于存储内容名称的名称元件212 和用于存储数据内容的数据元件21LPIT204可包括用于存储内容名称的名称元件216和存储端口211标识的请求端口元件218，所述端口211将兴趣报文转发至内容路由器200。 The CS202 may include a name element 212 for storing a content name and a data element for storing data contents 21LPIT204 may include a name element 216 for storing a content name and a storage port identifier element 211 of requesting port 218, the port 211 interest message will be forwarded to the content router 200. PIT204可跟踪上行转发至内容源的兴趣报文的轨迹，以便下行发送数据报文至请求者。 PIT204 interest may track uplink packet forwarding content source to a locus to downlink transmission data packet to the requestor. PIT204中的记录在用于转发匹配的数据报文之后即可删除。 The record PIT204 after the data packets for forwarding to delete matches. PIT204中记录从未发现匹配数据报文的兴趣的记录可在预定的时间段超时。 PIT204 never found recorded recording packets matching data of interest may be a predetermined period of time expires. FIB206可包括用于存储名称前缀的名称元件220和目的地列表元件222,该列表元件用于存储针对关联的名称前缀的“路标”路由器的标识。 FIB206 may include a name prefix for storing the name of the destination list element 220 and element 222, the identification element for storing a list of prefixes for association name "roadmap" router. RIB208可包括目的地元件224和用于存储端口211的转发端口元件226，通过所述端口211可到达所需内容的存储目的地。 RIB208 element 226 may comprise a forwarding destination port element 224 for storing port 211 and through port 211 to reach the desired content storage destination. 索引210可包括类型元件230和指针元件228,用于索引所述CS202、PIT204、FIB206和RIB208。 Type element 210 may include an index 230 and pointer element 228, for indexing the CS202, PIT204, FIB206 and RIB208. 这些组件在入兴趣处理过程中的交互在图4和5下面进一步描述。 These components of interest in the interaction process is further described in FIGS. 4 and 5 below. 图3示出可用于使能被动路由的兴趣报文300和数据报文302的一项实施例。  Figure 3 shows a packet of interest can be used to passively routing a data packet 300 and Example 302. 添加RIB和修改内容路由器(例如图2中的内容路由器200)中FIB的语义可能需要在传统的兴趣报文和数据报文中添加字段。 RIB and add content router (e.g. FIG. 2 in the content router 200) in FIB semantics may require the addition of a conventional field interest packets and data packets. 传统的兴趣报文可不包含针对广播标识或目的地的字段。 Traditional interest message may contain fields for broadcast identification or destination. 兴趣报文300可包含内容名称字段304、选择者字段306、目的地字段308、广播标识位310和特定场合字段312。 Interest message 300 may include a content name field 304, a selector field 306, destination field 308, a broadcast flag fields 310 and 312 a particular application. 内容名称字段304可存储兴趣报文300标识的内容的名称。 Content name field 304 can store the name of the message content of interest 300 identified. 选择者字段306 可定义选择过程对输入的单个报文执行何种动作。 A selector field 306 may define the input selection process of the individual packets which action to take. 如果目的地标识已知，目的地字段308可包含目的地标识。 If the destination identifier is known, the destination identification field 308 may comprise the destination. 将广播指示位310设置为“Γ可表示广播兴趣(B兴趣），而将广播指示位310设置为“0”可表示非广播兴趣(NB兴趣）。呢兴趣值可按照路由器中FIB匹配设置。在知晓的情况下，内容路由器(例如图2中的内容路由器200)可将路由器名称填入NB兴趣内的目的地字段308中，所述路由器名称为与通往目的地或源的传输路径（8卩“路标”路线）关联的路由器的名称，例如最接近源的路由器。在B兴趣中，目的地字段308可为空，例如在目的地字段308中填入空值。现有技术已知，特殊场合字段312可包括鉴权协议中发布的随机或伪随机数字，以确保旧的通信在重放攻击中不能重用。 The broadcast indicator bit 310 is set to "Gamma] may represent a broadcast of interest (B interest), and the broadcast indicator bit 310 is set to" 0 "may represent a non-broadcast interest (NB interest). Yet interest value can FIB match the settings according to the router. in the case of known, content router (e.g., content router 200 in FIG. 2) may be a router name into the destination field 308 of interest within the NB, the router and the name of the transmission path leading to the destination or source ( 8 Jie "signposts" line) associated with the name of the router, e.g. a router closest to the source. interest B, the destination field 308 may be empty, for example, are known in the prior art in the destination field 308 of nulls filled. , special occasions field 312 may include authentication protocol published in a random or pseudorandom number, to ensure that old communications can not be reused in replay attacks. 传统数据报文可能不包含标识数据源的字段。  The conventional message may not contain the data fields identify the data source. 数据报文302可包含内容名称字段314、签名字段316、签名信息字段318、源字段320和数据字段322。 Data packet 302 may include a content name field 314, a signature field 316, signature information field 318, source field 320 and a data field 322. 源字段320可包含内容源标识，可为更新FIB提供参考。 Source field 320 may comprise the content source identifier may be updated to provide a reference for FIB. 在一些实施例中，出于隐私保护的目的，源可模糊其自己的名称，例如细分其名称。 In some embodiments, for purposes of privacy protection, source may blur its own name, for example, segment name. 进一步地，在一些实施例中可能有针对某一给定内容的多个源，且中间路由器可在源字段320中填写其自己的名称。 Further, in some embodiments there may be a plurality of sources for a given content, and the intermediate routers can enter their own name in the source field 320. 如图1所述，不满意的PIT匹配可导致未来兴趣无响应。  As shown in Figure 1, can result in unsatisfactory PIT match future interest unresponsive. 该问题可由广播标识位310 处理。 This problem is solved by a broadcast flag 310 process. 缺乏的属性之一便是潜在环形拓扑，其中该环上的一些路由器(如图2中的节点108) 按照其PIT策略禁止进一步转发兴趣。 One property is the potential lack of ring topology, wherein some of the router on the ring (node ​​108 in FIG. 2) to inhibit further forward PIT interest in accordance with its policy. 通过允许路由器(例如节点108)在一些条件下进一步转发B兴趣。 By allowing the router (e.g., node 108) is further forwarded B interest under certain conditions. 在图1中，这可对应于从108转发至110和从114转发至102的B兴趣，即在顺时针方向和逆时针方向遍历环形拓扑。 In FIG. 1, which may correspond to a forward forwarded from 108 to 110 and from 114 to B 102 of interest, i.e. to traverse ring topology in clockwise and counterclockwise directions. 因此，一旦该环中的任一路由器接收到数据报文，所有其他路由器可最终清除对应的PIT记录。 Thus, once the ring is any one of a router receives a data packet, all the other routers may eventually clear the corresponding PIT records. 因此，当内容路由器从在即时路由器PIT (即使对应的内容正在待定）中不存在的端口中接收到B兴趣时，该兴趣仍然可进一步广播。 Thus, the instant when the content router from the router in PIT (even if the corresponding content is determined) is not present in the port B of interest is received, the broadcast of interest still further. 针对任意B兴趣，如果在CS中发现所需的内容，则最终以该发现的内容回复该兴趣。  For any interest in B, if you find the desired content in the CS, the final content of the reply to the discovery of interest. 如果入端口没有以前的请求相同内容的请求消息且FIB (例如图2中的FIB206)没有所述请求内容的目的地信息，则可将其进一步广播。 If the ports are not requesting message requesting the same content of the previous and the FIB (e.g. FIB206 in FIG. 2) is not a destination of the requested content information, it can be further broadcasting. 然而，如果FIB有目的地信息，则该兴趣可作为NB兴趣(例如通过更改广播标识位310和填写目的地字段)转发至通向目的地的端口（例如图2中的端口211).针对任意NB兴趣，由于目的地已经填写，可根据RIB (例如图2中的RIB206)直接以单播方式转发该兴趣。 However, if there is destination information FIB, as interest in the NB interest (e.g., by changing the flag bit 310 and a broadcast destination field filled) forwarding port (e.g., port 211 in FIG. 2) through to the destination. For any NB interest, since the destination has been filled, can directly forward the unicast interest according to the RIB (e.g. in FIG. 2 RIB206). 替代实施例可使用广播方法(如类似的原始CCN/NDN 设计)转发该兴趣，例如在广播前将NB兴趣转换为B兴趣。 Alternative embodiments may use broadcast method (e.g., similar to the original CCN / NDN design) forward the embodiment of interest, for example, prior to converting the broadcast interest is B NB interest. 然而，在这种实施例中，可能仍然需要中间路由器在发现CS匹配的情况下来直接回复内容数据。 However, in such an embodiment, the intermediate router may still be required in the case of a direct reply data found down CS match. 图4示出内容路由器(如图2中的内容路由器200)从端口接收兴趣的一项实施例的流程图400。  FIG. 4 shows the contents of a router (content router 200 in FIG. 2) of interest received from the flow diagram of an embodiment of the port 400. 图4中的CS、PIT、FIB、RIB、索引和端口实质上与图2中的CS202、PIT204、FIB206、 RIB208、索引210和端口210相同。 FIG 4 CS, PIT, FIB, RIB, and indexing ports substantially CS202 in FIG. 2, PIT204, FIB206, RIB208, ports 210 and 210 the same index. 在块402,内容路由器可从请求端口（例如图2中的端口211)接收兴趣(例如图3中的兴趣报文300)。 At block 402, the router may receive the content of interest (e.g., FIG. 3 interest message 300) from the requesting port (e.g., port 211 in FIG. 2). 在块404,在CS中查找内容名称(例如在图2中的名称元件212中）以确定所述内容名称在该CS中是否存在。 At block 404, to find the content name (e.g. name in Figure 2 element 212) in the CS to determine whether the content name is present in the CS. 如果存在，则内容路由器可从例如图2中的数据元件214接收数据并将数据报文转发至406中的请求端口。 If present, the content router may, for example, from the data elements in FIG. 2 214 receives data and forwards the data message to the requesting ports 406. 如果在块404返回否定结果，则在块408检查PIT查看该PIT中是否存在与该内容名称(例如在图2中的名称元件212中）关联的记录。 If a negative result is returned at block 404, at block 408 checks to see if the PIT records the content name (e.g. name in Figure 2 element 212) associated with the presence of the PIT. 如果记录存在，则在块410中PIT可添加该请求端口至与该内容名称关联的请求端口列表中，例如在请求端口元件218中。 If the record is present, then in block 410 may be added to the PIT request to a port name of a port list request associated with the content, for example in the request port element 218. 接着，在块422，内容路由器可等待数据返回，例如通过图3中的数据报文302。 Next, at block 422, the content router may wait for data to return, for example, data packet 302 in FIG. 3 by. 如果记录不存在，则在块412中，进程400添加包含内容名称和请求端口标识的新PIT记录。 If the record does not exist, at block 412, process 400 to add a new record comprising a content name and a PIT request for port identification. 在块414,进程400检查该内容名称是否存在于FIB 中，例如图2中的名称元件220。 At block 414, process 400 checks whether the content exists in the name of the FIB, such as a name element 220 in FIG. 2. 如果不存在对应该内容名称的记录，则内容路由器可将该NB 兴趣转换成B兴趣并在块416将该兴趣广播至除该请求端口之外的所有相邻端口以及在422 等待数据返回。 If the contents to be recorded on the name does not exist, then the content router may be converted into the B NB interest interest and the interest in block 416 is broadcast to all other ports of the request other than the adjacent port 422, and waits for return data. 如果FIB中不存在相应记录，则在418中内容路由器可从FIB目的地列表(例如图2中的目的地列表元件222)中获取目的地，并可检索例如存储在图2中的转发端口元件226中的RIB转发端口。 If the corresponding record does not exist in the FIB, then the content 418 from the router FIB destination list (e.g., FIG. 2 in the destination list element 222) acquires the destination, for example, port forwarding and retrieving stored in the element 2 of FIG. 226 RIB port forwarding. 在块420，进程400可将B兴趣转换为NB兴趣并转发该兴趣至RIB中列出的端口，以及在块422，等待数据返回。 At block 420, process 400 may be converted to B NB interest interest and interest to the forwarding port RIB listed, and at block 422, waiting for data to return. 如前所述，PIT记录可能会在预定的广播和/或转发与数据返回之间的间隔内超时。 As described above, PIT records may time out a predetermined interval between the broadcast and return or forward the data /. 图5示出内容路由器(如图4中的内容路由器)接收返回数据的一项实施例的流程图500。  FIG. 5 shows the contents of the received return data router flowchart 500 of an example of embodiment (FIG. 4 content router). 图5中的组件实质上可与图4中的组件相同。 The components in FIG 5 may be substantially the same components as those in FIG. 4. 进程500可开始于从端口（例如图2中的端口211)接收数据(例如图3中的数据报文302)。 Process 500 may begin receiving data (e.g. in the data packet 302 in FIG. 3) from the port (e.g., port 211 in FIG. 2). 进程500接下来可以在PIT中检查内容以确定PIT中是否包含针对该数据的待定兴趣，例如在图2中的名称元件212中。 Next, the process 500 may examine the contents of the PIT PIT to determine whether to include a pending interest for the data, for example, in Figure 2 the name element 212. 如果PIT不记载任何兴趣端口，则在块506,内容路由器可丢弃该报文并在块508结束进程500。 If not described any Interests PIT port, at block 506, the content router may drop the packet at block 508 and the process 500 ends. 如果PIT记录存在，在块510，进程500可确定是否需要更新CS。 If PIT records exist, at block 510, process 500 may determine whether to update the CS. 如果需要更新，则在块512可添加记录至该CS，例如使用CS名称和图2中的数据元件212和214。 If the update is needed, at block 512 may be added to the record the CS, for example, the data element name and 2 CS 212 and 214. 如果CS不需要更新，则进程500可继续， 且在块514,进程500可确定是否更新FIB。 If CS is not necessary to update, the process 500 may continue, and in block 514, the process 500 can determine whether to update the FIB. 如果需要更新，则在块516,进程500可向FIB中添加记录，例如在图2中的名称和目的地列表元件220和222中。 If the update is needed, at block 516, process 500 may add a record to the FIB, such as the name and destination in the list element 220 of FIG. 2 and 222. 如果不需要更新，则进程500可继续。 If you do not update, the process 500 may continue. 可选地，内容路由器可使用自己的名称更新报文中的源字段，例如图3中的源字段320。 Alternatively, the content router may use the source field names own update packet, e.g. FIG. 3 source field 320. 该名称也可以选择模糊化以达到保护隐私等目的。 The name can also choose to blur in order to protect privacy and other purposes. 在块518,进程500可转发数据报文至PIT中存储的与所述命名数据内容关联的所有请求端口。 At block 518, process 500 may forward data packets to the associated data stored in the PIT with the contents of all requests named ports. 在块520,进程500可在请求该命名数据内容的所有待定兴趣均满足时删除PIT记录，且进程500可在块508结束。 PIT records deleted at block 520, process 500 may satisfy the requests in the pending interest for all named data content, and the process 500 may end at block 508. 图6-11示出通过模拟来评估被动路由方案的一项实施例的图形化结果。  FIG 6-11 show graphical results of an embodiment of a passive routing scheme evaluated by simulation. 该模拟使用Abilene域内网络拓扑。 The simulation uses Abilene domain network topology. 使用的不同内容的数量为150,000且这些内容的总量为150太字节(TB)。 The number of different content using the content of the total amount of 150 to 150,000 and terabytes (TB). 请求这些内容的兴趣(如图3中的兴趣报文300)的到达率符合泊松分布。 The content request interest (interest message 300 in FIG. 3) of the arrival rate of Poisson distribution. 简单起见， 该模拟假设RIB (如图2中的RIB208)反应自展后的网络连通性，且PIT(例如图2中的PIT204) 大到足以容纳该拓扑。 For simplicity, the simulation assumes the RIB (RIB208 FIG. 2) to network connectivity since the exhibition, and the PIT (e.g. PIT204 in FIG. 2) large enough to accommodate the topology. 请注意，CS (如图2中的CS202)的替换策略为最少使用频率(LFU)，FIB 的替换策略为最近最少使用(LRU)或LFU。 Note, CS (in FIG. 2 CS202) replacement policy is the least frequently used (LFU), FIB replacement policy is a least recently used (LRU) or LFU. 在主动路由方案的模拟实施例中，内容源每隔T = 1000单位时间主动公布其内容。 In proactive routing scheme analog embodiment, the content source every unit time T = 1000 initiative to publish its content. 其他实施例可包括不同的替换策略，允许一定级别类缓存行为来基于一些与记录相关的测量标准路由记录。 Other embodiments may include different replacement policies, allowing a certain level of class cache behavior based on some measure associated with the recording route record. 例如，可采用大量先进的缓存算法，以允许FIB仅缓存流行名称前缀的下一跳信息，动态清楚“冷门”或不流行记录(例如具有相对较少的与内容关联的传输兴趣报文)来为与“热门”或更流行的内容关联的记录腾出空间。 For example, a large number of advanced caching algorithms to allow only the next hop information FIB cache popular name prefix, dynamic clear "popular" or unpopular record (e.g., a transmission having a relatively small interest message associated with the content) to recorded as "hot" or content associated with the more popular free up space. 其他测量标准可包括可达性和FIB缺失等，这对于本领域技术人员来说是显而易见的。 Other metrics may include a lack of accessibility FIB and the like, will be apparent to those skilled in the art. 评估中使用如下三个标准：（1)平均端到端(E2E)时延，反映用户体验到的服务质量，（2)广播报文的总数，反映协议效率和设计的可扩展性，以及⑶CS和FIB匹配率。  The following three criteria used in the evaluation: (1) Average end (the E2E) delay, reflecting the quality of service experienced by the user, the total number of (2) broadcast packets, protocol efficiency and to reflect design scalability and ⑶CS and FIB match rate. 每次实验中，运行多轮模拟，每轮有400,000兴趣“请求”，且上报平均性能。 In each experiment, simulation run multiple rounds, each round 400,000 interest "request", and the reported average performance. 如本文中采用的，CS大小比率(X)为CS大小相对内容总量的比例。 As employed herein, the ratio of the size of CS (X) relative to the total amount of content of size CS. 如本文中采用的，FIB大小比率（Φ)为FIB大小相对名称前缀总量的比例。 As employed herein, the ratio of the relative amount of FIB size ratio ([Phi]) is the size of a name prefix FIB. 图6示出平均E2E时延相对FIB大小比率Φ的汇总结果ΘΟΟΤΙΒ大小比率不断增大至1以展示明显趋势；实际上，Φ可能很小。  FIG. 6 illustrates summary results of average relative delay E2E ΘΟΟΤΙΒ size ratio of [Phi] FIB size ratio increasing to 1 to show a clear trend; in fact, Φ may be small. 如图6所示，主动和被动x = 0线在超过40毫秒(ms)时返回平均Ε2Ε时延，而其他改变X值的模拟情况返回的平均Ε2Ε时延约为25ms。 6, the active and passive line x = 0 returns the average time delay Ε2Ε exceeds 40 milliseconds (MS), and the average delay Ε2Ε simulate other changes return value X is approximately 25ms. 图7示出CS匹配率的汇总结果。  FIG. 7 shows the summary results of CS match rate. 图8示出FIB匹配率的汇总结果。 Figure 8 shows the summary results of FIB match rate. 图7和8中的CS和FIB大小比率在0.005和0.140之间波动。 FIGS. 7 and 8 CS and FIB size ratio fluctuates between 0.005 and 0.140. 在现实环境中这两个大小比率可能会很小。 In reality these two size ratio may be small. 图7中， 当X彡0.10时，主动和被动场景的CS匹配率均接近100%，这符合按照Zipf分布的内容请求， 以便大部分内容是“冷门”。 7, when X San 0.10, the CS active and passive scenes matching rate close to 100%, in line with the content of the request in accordance with Zipf distribution, so that most of the content is "popular." 图8中，当Φ <0.08时，被动LFU和LRU场景的FIB匹配率均成线性增长，且当Φ彡0.08时，其比主动LFU和LRU场景的CS匹配率大约高700-900%。 8, when Φ <0.08, the LRU and LFU the FIB match passive scenes rate increases linearly, and when [Phi] San 0.08, which is about 700-900% higher than the matching rate CS LRU and LFU active scene. 针对CS和FIB，优选LFU替换策略而非LRU。 For CS and FIB, preferably LFU replacement policy rather than LRU. 图9示出评估实施例中发送报文数量随CS大小(FIB大小比率Φ =10%)改变的情形。  FIG. 9 shows a case in Evaluation Example Number of packets sent over CS size (FIB size ratio Φ = 10%) change. 图9中，在主动场景下增加CS大小会减少广播报文的数量，因为大CS会吸收更多的兴趣报文。 Figure 9, will increase the size of the CS scene at the initiative of reducing the number of broadcast packets, because the big CS will absorb more interested in the message. 然而，被动场景下广播报文的数量可能比主动方案下低二到三个量级。 However, the number of passive scene broadcast packets may be lower than under the initiative program two or three orders of magnitude. 实际上，由于内容数量可能会更大，改善可能会更加高。 In fact, since the amount of content could be bigger, more improvement may be high. 图10示出结果随FIB大小（CS大小比率X = 10%)变化的情形。  FIG. 10 shows the results with the case of changing the size of the FIB (CS size ratio X = 10%). 由于主动发布开销大，图10中示出的主动方案可能对FIB大小不太敏感。 Since the active release large overhead, shown in FIG. 10 may be less sensitive to the active program FIB size. 相反，被动方案可将广播报文减少大约二到三个量级，部分是因为FIB匹配后的兴趣处理。 In contrast, passive scheme can reduce broadcast packets about two to three orders of magnitude, in part because interest in treatment of FIB match. 图11示出两者结合对减少广播开销的影响。  FIG. 11 shows the effect of a combination of both a broadcast overhead reduction. 图中示出的曲线对应于FIB和CS大小同时变化时被动方案的性能。 The curves shown correspond to the performance of a passive scheme when CS and FIB simultaneously changed size. 当CS大小很小(例如约为x<5%)时，增加FIB大小会改善系统效率。 When CS is small in size (e.g., approximately x <5%), increasing the size of the FIB will improve the system efficiency. 例如，将φ从0.02增加至0.08会使广播报文数量降低二到三个量级。 For example, to increase from 0.02 to 0.08 φ broadcast packets will reduce the order of two to three. 当CS大小增至大约超过8%时，改善的量可能会降低。 When CS size increases to approximately more than 8%, the amount of improvement may be reduced. 当请求内容集足够大时，任何单个路由器的CS不太可能缓存所有内容中8%或更多的内容。 When a sufficiently large set of requested content, any single router unlikely CS buffer content of 8% or more of all content. 进一步地，CS大小既可影响E2E时延又可影响广播开销，而FIB大小只能影响后者。 Further, CS size can affect the E2E delay but also affect the broadcast overhead, and FIB only affect the size of the latter. 图6-11示出的模拟结果表示E2E时延对CS大小比率敏感而对FIB大小比率不敏感。  The simulation results shown in FIG. 6-11 represents the CS size ratio E2E delay sensitive and insensitive FIB size ratio. 当CS大小比率超过一定门限（例如图7中的约20%)时，E2E时延可能不会进一步降低。 When the CS size ratio exceeds a certain threshold (e.g., about 20% in FIG. 7), E2E delay may not be further reduced. 在图6 所述的情况下，主动和被动方案可能：（1)在平均E2E时延方面产生微不足道的差别，部分是因为内容源目的地是否已知，例如通过呈现与名称对应的FIB记录，或者(2)不会降低E2E时延，这是由于兴趣广播也可延最短路径到达内容源。 In the case of FIG. 6, may be active and passive programs: (1) produced negligible difference in terms of average delay E2E, partly because if the content source destination is known, for example, by presenting FIB record corresponding to the name, or (2) does not decrease E2E delay, which is broadcast may also be extended due to the interest in the shortest path to the content source. 这些结果进一步标明，在现实中的名称导向网络中，CS大小对E2E时延的影响更大于FIB大小对时延的影响。 These results further indicate, name-Oriented Network in reality, the effect of the size of the CS E2E delay greater impact on FIB size of delay. 如上所述，被动内容中心路由方案可处理域内网络的可扩展性难题。  As described above, the passive scheme can handle a content-centric routing within the network scalability problems. 评估标明被动路由方案的报文数量可比主动方案的报文数量低二到三个量级，而同时保持大约同等级的用户体验到的E2E时延。 The lower two to three orders of magnitude packet routing scheme passive assessment indicate the number of packets than the number of active programs, while maintaining approximately the same level of user experience to the E2E delay. CS大小比率既可影响E2E时延又可影响广播开销，而FIB大小比率只能影响后者。 CS E2E size ratio can affect delay in turn affect the broadcast overhead, while the latter can only affect the size ratio FIB. 然而，当CS仅缓存一小部分内容时，增加FIB大小可能不可避免且可能导致广播数量降低二到三个量级。 However, when the CS cache only a small part, to increase the size of the FIB may inevitably reduce the number of broadcast and may result in two or three orders of magnitude. 提出的方案也可处理无响应兴趣问题，并可有效减少FIB匹配后的广播兴趣。 The proposed solution can be interested in processing problems no response, the broadcast of interest can effectively reduce the FIB match. 本发明中描述的至少一些特征/方法可以在网络装置或组件中实施，例如网络节点或单元。  at least some of the features / methods of the invention described may be implemented in a network device or component, such as a network node or element. 例如，本发明中的特征/方法可以使用硬件、固件和/或安装在硬件上运行的软件来实施。 For example, the present invention features / methods may be implemented using hardware, firmware, and / or install software running on hardware. 网络装置/组件或单元可为通过网络传输帧的任意设备，例如交换机、路由器、网桥和服务器等。 Network device / component or unit may be any device frames transmitted through the network, such as switches, routers, bridges, servers, and the like. 图12示出了网络节点1200的一项实施例，该网络节点可为通过网络传输和处理数据的任意设备。 FIG 12 illustrates an embodiment of a network node 1200, the network node may be any device through the network transmission and processing of data. 例如，网络节点1200可为内容路由器或上述CCN/NDN方案中的任意节点或路由器。 For example, node 1200 may be any network node or a router or said content router CCN / NDN scheme. 网络节点1200可用于实施或支持上述自适应转发策略。 The network node 1200 may be used to implement or support said adaptive forwarding policy. 网络节点1200可以包含一个或多个入端口或接口1210,所述入端口或接口耦合到接收器(Rx) 1212,用于从其他网络组件接收信号和帧/数据。 The network node 1200 may comprise one or more ingress ports or interfaces 1210, into the ports or interfaces coupled to the receiver (Rx) 1212, and for receiving a signal frame data to / from other network components. 网络节点1200可以包括内容识别单元1220,用于确定将内容发送到哪些网络组件。 The network node 1200 may include a content identification unit 1220, for determining which network components to transmit content. 内容识别单元1220可以使用硬件、软件或两者结合来实施。 Content identification unit 1220 can be implemented using hardware, software, or a combination of both embodiments. 内容识别单元1220可包括通用处理器1225,该通用处理器可为专用集成电路(ASIC)或数字信号处理器(DSP)。 Content ID unit 1220 may include a general purpose processor 1225, which may be a general purpose processor, application specific integrated circuit (ASIC) or digital signal processor (DSP). 网络单元1200还可以包括一个或多个出端口或接口1230,所述出端口或接口耦合到发射器(Tx) 1232,用于将信号和帧/数据传输到其他网络组件。 Network unit 1200 may further include one or more of the ports or interfaces 1230, the outlet port or interface is coupled to a transmitter (Tx) 1232, and the frame for transmitting the signal / data to other network components. 接收器1212、内容识别单元1220和发射器1232还可用于基于硬件、软件或者两者结合来实施至少一些所公开的方法。 Receiver 1212, the content identification unit 1220 and transmitter 1232 may also be based on hardware, software, or a combination of both at least some of the embodiments of the disclosed methods. 网络节点1200的组件可按照图12所示进行布置。 Components of the network node 1200 may be arranged in accordance with FIG. 12. 内容识别单元1220也可以包括可编程内容转发平面块1228,以及可以耦合到所述可编程内容转发平面块1228的一个或多个存储块1222。  The content identification unit 1220 may include a programmable content forwarding plane block 1228, and may be coupled to the programmable content forwarding plane block 1228 a 1222 or more memory blocks. 可编程内容转发平面块1228可以用于实施内容转发和处理功能，例如在开放系统互连(OSI)模型中的应用层或三层(L3)，其中可以基于内容名称或前缀对内容进行转发，并且可能基于将内容映射到网络流量的其他内容相关信息而进行转发。 The programmable content forwarding plane block 1228 may be used to implement content-forwarding and processing, such as an application layer or three layers of the Open Systems Interconnection (OSI) model (L3), where the content may be forwarded based on content name or prefix, and possibly other content-related information based on content mapped to network traffic and forwards. 此类映射信息可保存在内容识别单元1220或网络单元1200中的内容表中。 Such mapping information table of contents can be stored in the network or the content identification unit 1220 of the unit 1200. 可编程内容转发平面块1228可翻译用户的内容请求，并相应地根据元数据和/或内容名称等从网络或其他网络路由器提取内容，且能够以暂时等方式将内容存储在存储块1222中。 The programmable content forwarding plane block 1228 may be translated subscriber requests and corresponding metadata and / or content names extracted from the content or other network routers, etc., and can be temporarily stored in the content storage block 1222. 可编程内容转发平面块1228随后可将缓存内容转发至用户。 The programmable content forwarding plane block cache 1228 may then forward the content to the user. 可编程内容转发平面块1228可以使用软件、硬件或两者的结合来实施，并且可以在OSI模型中的IP层或L2层中操作。 The programmable content forwarding plane block 1228 may be used, or a combination of hardware and software of both embodiments, and the L2 layer or the IP layer in the OSI model in operation. 存储块1222可包括用于临时存储内容的缓存1224，例如随机存取存储器(RAM)。 Block 1222 may include a cache memory for temporarily storing the content 1224, such as random access memory (RAM). 另外，存储块1222可以包含用于相对长久地存储内容的长期存储装置1226,如只读存储器(ROM)。 Further, the memory block 1222 may comprise a long-term storage means for storing relatively long content 1226, such as a read only memory (ROM). 例如，缓存1224和长期存储器1226可包括动态随机存取存储器(DRAM)、固态驱动器(SSD)、硬盘或其组合。 For example, the cache memory 1224 and 1226 may include a long-term dynamic random access memory (DRAM), a solid state drive (the SSD), a hard disk, or a combination thereof. 值得注意的是，存储块1222可用于存储内容路由器（如图2中的内容路由器200)的内容，例如图2中的05202、？ Notably, the memory block 1222 may store the content router (for content router 200 in FIG. 2), for example, in FIG. 205,202 ,? 几204小四206、1?18208和/或索引210。 A few small four 206,1 204? 18 208 and / or 210 index. 应理解，通过将可执行指令编程和/或加载至网络节点1200上，处理器1220、缓存1224和长期存储器1226中的至少一个被改变，将网络节点1200的一部分转换成特定机器或装置，例如本发明宣扬的拥有新颖功能的视频编解码器。  It should be understood, by programming executable instructions and / or loaded onto a network node 1200, a processor 1220, a buffer 1224, and are changed at least in the long term memory 1226, converted into a part of the network node 1200 of a particular machine or means, for example, the present invention is novel functionality to promote video codec. 通过加载可执行软件至计算机来实施的功能可以通过公知设计规则转换成硬件实施，这在电力工程和软件工程领域是很基础的。 It can be converted by loading executable software into the computer functions to be implemented by well-known design rules to be implemented in hardware, which in electrical engineering and software engineering is very basic. 决定通过软件还是硬件来实施一个概念通常取决于对设计稳定性及待生产的单元数量的考虑，而不是从软件域转换至硬件域所涉及的任何问题。 A decision implemented by software or hardware concept generally depends on the number of cells to be considered for the design and production stability, rather than translating from the software domain to any hardware problem domain involved. 一般来说，经常变动的设计更适于在软件中实施，因为重新编写硬件实施比重新编写软件设计更为昂贵。 In general, the design change frequently preferred to be implemented in software, hardware implementation because rewrite more expensive than re-writing software design. 一般来说，稳定及大量生产的设计更适于在硬件(如ASIC)中实施，因为硬件实施的大量生产较软件实施更为便宜。 In general, stable and better suited to mass production design implemented in hardware (such as ASIC), because the hardware implementation of mass production cheaper than the software implementation. 设计通常可以以软件形式进行开发和测试，之后通过公知设计规则转变成专用集成电路中等同的硬件实施，该集成电路硬线软件指令。 Software can usually be designed in the form of development and testing, after the transition to the equivalent ASIC in hardware embodiment by well-known design rules, the software instructions hardwired integrated circuit. 由新ASIC控制的机器是一特定的机器或装置，同样地，编程和/或加载有可执行指令的电脑可视为特定的机器或装置。 Machines controlled by the new ASIC is a particular machine or apparatus in the same manner, the programming and / or loaded with a computer-executable instructions may be considered as a particular machine or apparatus. 本发明公开至少一项实施例，且所属领域的普通技术人员对所述实施例和/或所述实施例的特征作出的变化、组合和/或修改均在本发明公开的范围内。 Variation embodiments and / or embodiments of ordinary skill in the  embodiment of the present invention, at least one disclosed embodiment, and those skilled in the embodiment made of combinations and / or modifications within the scope of the present invention are disclosed in . 因组合、合并和/或省略所述实施例的特征而得到的替代性实施例也在本发明公开的范围内。 Alternative embodiments characterized by a combination of combined and / or omitted in the embodiments obtained embodiments are within the scope of the present invention is disclosed. 应当理解的是， 本发明已明确阐明了数值范围或限制，此类明确的范围或限制应包括涵盖在上述范围或限制(如从大约1至大约10的范围包括2、3、4等;大于0.10的范围包括0.11、0.12、0.13等）内的类似数量级的迭代范围或限制。 It should be understood that the present invention has been specifically set forth numerical ranges or limitations, such express ranges or limitations should be included encompassed stated ranges or limitations (e.g., from about 1 to about 10 includes, 2, 3; greater than range 0.10 includes magnitude iterative ranges or limitations within 0.11,0.12,0.13 etc.). 例如，无论何时公开具有下限Rl和上限Ru的数值范围时，任何在该范围内的数值均已具体公开。 For example, whenever a numerical range with a lower limit and an upper limit Ru, Rl, any number falling within the range have been specifically disclosed. 具体而言，具体公开了在所述范围内的以下数字:R = Rl+k*(Ru-Rl)，其中k是从1%到100%以1%增量递增的变量，SP，k是1%、2%、3%、4%、 5%、……、50%、51%、52%、……、95%、96%、97%、98%、99% 或100%。 Specifically, the specifically disclosed in the following numbers within the range: R = Rl + k * (Ru-Rl), wherein k is from 1% to 100% in 1% increments increments a variable, the SP, is k 1%, 2%, 3%, 4%, 5%, ......, 50%, 51%, 52%, ......, 95%, 96%, 97%, 98%, 99% or 100%. 此外，还具体公开了由两个R数字定义的如上所述的任何数值范围。 Further, any numerical range specifically disclosed above defined by two R numbers. 除非另行说明，使用的术语“大约”表示其后数值的±10%的范围。 Unless otherwise noted, the term "about" means the subsequent number of ± 10%. 相对于权利要求的任一元件使用的术语“可选地”表示需要所述元件或者不需要所述元件，这两种替代方案均在所述权利要求的范围内。 A member with respect to terms used in the claims "optionally" means that the element or the element is not required, it is within the scope of the claims in both alternatives. 广义术语如“包括”、 “包含”和“具有”等的使用，应被理解为对窄义术语如“由…组成”、“基本上由…组成”以及“大体上由…组成”等的支持。 Broad terms such as "comprising", "including" and "having," and the like used should be understood as a narrow sense of the term, such as "consisting of ...", "essentially consisting of ..." and "substantially consisting of ...", etc. stand by. 本文所述的所有文档都以引用的方式并入本文中。 All documents described herein are incorporated by reference herein. 虽然本发明中已提供若干实施例，但应理解，在不脱离本发明的精神或范围的情况下，本发明所公开的系统和方法可以以许多其他特定形式来体现。  While several embodiments of the present invention have been provided, it is to be understood that, without departing from the spirit or scope of the present invention, the system and method disclosed in the present invention may be embodied in many other specific forms. 本发明的示例应被视为说明性而非限制性的，且本发明并不限于本文本所给出的细节。 Example of the present invention is to be considered as illustrative and not restrictive, and the invention is not limited to the details given herein. 例如，各种元件或组件可以在另一系统中组合或合并，或者某些特征可以省略或不实施。 For example, the various elements or components may be combined or incorporated in another system or certain features may be omitted, or not implemented. 此外，在不脱离本发明的范围的情况下，各种实施例中描述和说明为离散或单独的技术、系统、子系统和方法可以与其他系统、模块、技术或方法进行组合或合并。  Further, without departing from the scope of the present invention, the various embodiments described and illustrated may be combined as discrete or separate techniques, systems, subsystems and methods with other systems, modules, techniques, or methods, or embodiments merge. 展示或论述的彼此耦合或直接耦合或通信的其他项也可以采用电方式、机械方式或其他方式通过某一接口、设备或中间组件间接地耦合或通信。 Shown or discussed coupled or directly coupled or communicating with other items may also be used electrically, mechanically, or otherwise coupled or communicating through some interface, device, or intermediate component indirectly. 其他变化、替代和改变的示例可以由本领域的技术人员在不脱离本文精神和所公开的范围的情况下确定。 Other changes, substitutions, and examples may be altered by those skilled in the art herein without departing from the spirit and scope of the disclosed determined. 1. 一种路由内容的方法，包括： 从第一端口接收兴趣报文，其中所述兴趣报文包括带有第一内容名称的内容名称字段、目的地字段和设置为广播的广播标识字段，其中所述广播标识字段指示所述第一端口以前是否接收过包含所述第一内容名称的请求；以及从第二端口接收数据报文，其中所述数据报文包括带有第二内容名称的内容名称字段、带有与所述第二内容名称关联的数据源标识的源字段和带有与所述第二内容名称关联的数据的数据字段。 A method for routing content, comprising: receiving packets of interest from the first port, wherein said message includes a content name of interest with a first content name field, a destination field set to a broadcast and a broadcast identification field, wherein the broadcast identifier field indicates whether the first port through the previously received content request comprising the first name; and receiving data packets from the second port, wherein the data packet includes a name of the content with a second a content name field, a source field associated with the second content identification name of the data source and a data field with the data associated with the name of the second content. 2. 根据权利要求1所述的方法，进一步包括： 转发兴趣报文至第三端口，其中所述第三端口的标识从关联于目的地的可达性信息库RIB记录中选择，且所述目的地从关联于所述第一内容名称的转发信息库FIB记录中的目的地列表中选择。 2. 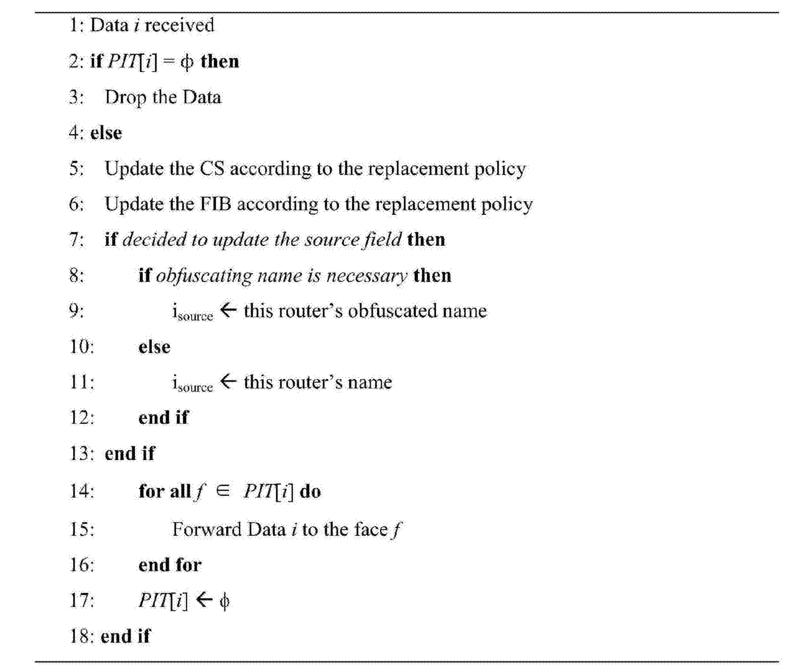 The method according to claim 1, further comprising: forwarding packets of interest to the third port, wherein said third port identifier is selected from the reachability information associated with the database RIB recording destination, and the select a destination from the destination list associated with the content name of the first forwarding information base in FIB record. 3. 根据权利要求2所述的方法，进一步包括转发所述兴趣报文前，将广播标识字段设置为非广播。 3. 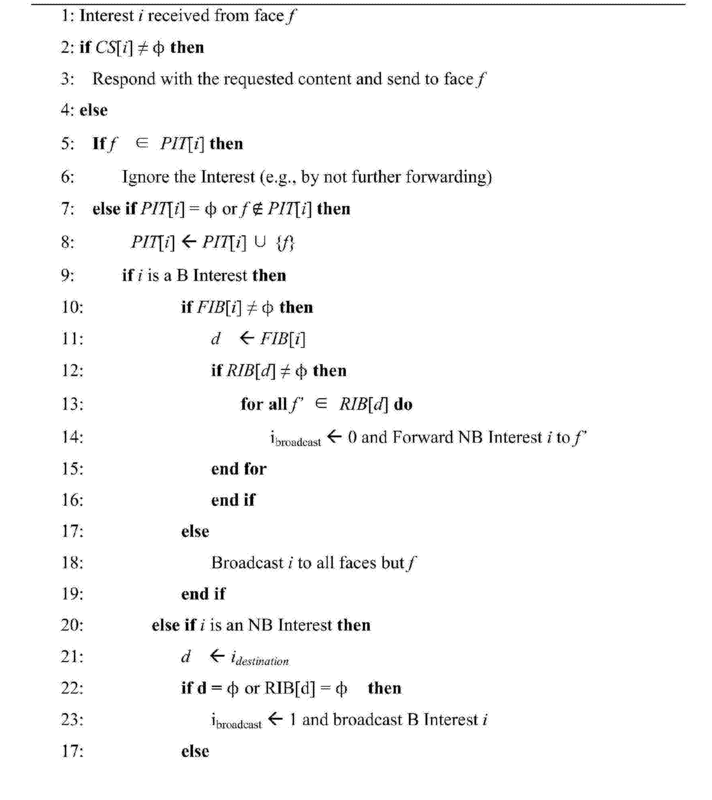 The method according to claim 2, further comprising forwarding the interest message before the broadcast identification field to a non-broadcasting. 4. 根据权利要求1所述的方法，进一步包括： 在内容存储器CS中查找与所述第一内容名称关联的记录； 如果该CS记录存在，则发送与该CS记录关联的数据至所述第一端口； 如果该CS记录不存在： 在待定兴趣表PIT中查找与所述第一内容名称关联的记录； 如果该PIT记录存在，则添加所述第一端口的标识至该PIT记录中；以及如果该PIT记录不存在，则为所述第一内容名称创建一PIT记录。 4. The method according to claim 1, further comprising: first find a record associated with the content name in the content store CS; CS if the record exists, the transmission data records associated with the CS to the second a port; CS if the record does not exist: Find record name associated with the first content in the PIT pending interest table; PIT if the record exists, add the identifier of the first port to the PIT records; and PIT If the record does not exist, compared with the first content record name to create a PIT. 5. 根据权利要求4所述的方法，进一步包括： 在转发信息库FIB中查找与所述第一内容名称关联的记录； 如果该FIB记录不存在，则广播所述兴趣报文至多个端口； 如果该FIB记录存在： 接收至少一个关联于该FIB记录中列出的目的地的转发端口；以及转发所述兴趣报文至所述至少一个转发端口。 The method according to claim 4, further comprising: first find a record associated with the content name in the FIB forwarding information base; FIB If the record does not exist, the broadcast packet to the plurality of ports of interest; If the FIB record exists: receiving at least one port associated with the forwarding destination listed in the FIB record; and forward the interest packet to the at least one forwarding port. 6. 根据权利要求5所述的方法，其中所述第一内容名称与所述第二内容名称相同，且不存在与所述第一内容名称关联的CS记录，进一步包括： 新建CS记录，其中所述CS记录包括所述第一内容名称和所述数据；以及添加源标识至与所述第一内容名称关联的FIB记录中的所述目的地列表中。 6. The method as claimed in claim 5, wherein the first content and the second content name of the same name, CS associated with the first recording content name do not exist, further comprising: recording the new CS, wherein the CS comprises a first recording the content name and the data; and adding to the list of destinations source identification FIB record associated with the name of the first content. 7. 根据权利要求5所述的方法，其中所述FIB记录存在，进一步包括基于与所述FIB记录关联的至少一个测量标准更新所述FIB记录。 7. The method as claimed in claim 5, wherein said FIB record exists, further comprising updating the standard FIB record based on at least one measurement associated with the FIB record. 8. —种装置，适用于所述权利要求1-7所述的方法，所述装置包括:接收器、处理器和发射器； 所述接收器从第一端口接收兴趣报文，其中所述兴趣报文包括带有第一内容名称的内容名称字段； 所述处理器将所述第一内容名称和所述第一端口的标识添加至待定兴趣表PIT; 以及从转发信息库FIB获取与所述内容名称关联的目的地； 以及从可达性信息库RIB中检索与通往所述目的地的传输路径关联的第二端口的标识； 所述发射器转发所述兴趣报文至所述第二端口。 8. - species apparatus suitable for the method of claim 1-7, the apparatus comprising: a receiver, a processor and a transmitter; receiver receives the interest message from the first port, wherein said interest message includes a content name field with the name of the first content; the processor of the first name and the content identifier of the first port of the PIT added to the pending interest table; and acquiring the forwarding information bases FIB from said destination name associated content; identifying a second port and a transmission path from the reachability information database access RIB retrieves the associated destination; the transmitter to forward the interest packet to the first two-port. 9. 根据权利要求8所述的装置，其中所述兴趣报文进一步包括广播标识。 9. The apparatus according to claim 8, wherein the interest message further include a broadcast identification. 10. 根据权利要求9所述的装置，其中所述处理器进一步用于从FIB接收到目的地后，将所述广播标识设置为非广播。 10. The apparatus according to claim 9, wherein the processor is further for receiving from the FIB to the destination, the non-broadcast broadcast identifier is provided. 11. 根据权利要求8所述的装置，其中所述接收器进一步用于等待接收包含与所述内容名称对应的数据的数据报文。 11. The apparatus according to claim 8, wherein the receiver is further for waiting to receive data packets comprising a content name corresponding to the data. 12. 根据权利要求8所述的装置，其中所述目的地包括空值，且其中所述第二端口从多个可用网络路径中选择。 12. The apparatus according to claim 8, wherein said destinations include a null value, and wherein said second port selected from a plurality of available network path. 13. 根据权利要求8所述的装置，其中所述接收器，还用于从第三端口接收数据报文，其中所述数据报文包括带有第二内容名称的内容名称字段和带有数据的数据字段； 所述处理器，还用于验证所述第二内容名称与PIT中的记录相关联； 以及检索与该记录关联的至少一个请求端口的标识； 所述发射器，还用于将所述数据报文转发至所述至少一个请求端口。 13. The apparatus according to claim 8, wherein said receiver is further for receiving data packets from the third port, wherein the data packet includes a content name field with the name of the second content data and having data field; the processor is further configured to validate the second content and recording the name associated with the PIT; and at least one port identifier associated with a request to retrieve the records; and the transmitter is further configured to the data packets forwarded to the at least one request port. 14. 根据权利要求13所述的装置，其中所述处理器进一步用于将所述第二内容名称和所述数据添加到内容存储器CS中。 14. The apparatus according to claim 13, wherein the processor is further configured to add the second content data to the content name and the memory CS. 15. 根据权利要求8所述的装置，其中所述处理器进一步用于应用FIB中的替换策略，所述替换策略包括基于与FIB记录关联的至少一个测量标准来更新FIB记录。 15. The apparatus according to claim 8, wherein the processor is further alternative strategy for applying the FIB, the FIB comprising updating the replacement policy based FIB record record associated with at least one measure.